This is a continuation of my previous post where I implemented a function for Trapezoidal rule. This time around, I will implement a class and include Simpson's rule. Along the way, I will point out the key differences between the procedural and object oriented approaches to programming. 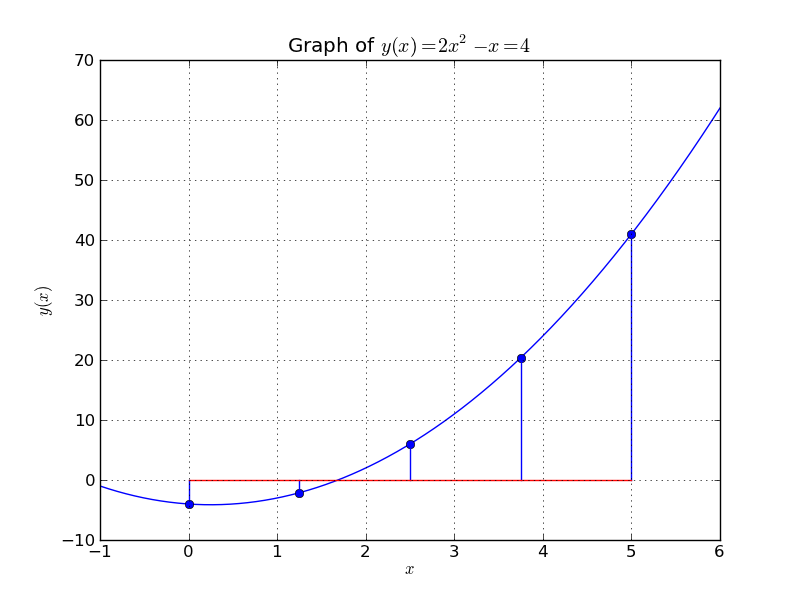 Here is a graph showing the function as well as values of the function at 5 equally spaced points from a=0 to b=5. 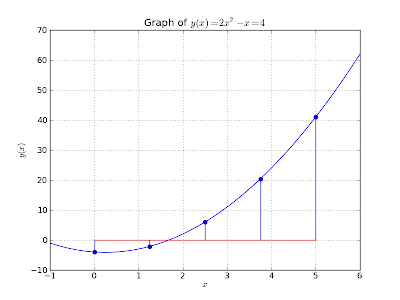 Since Simpson's 1/3 rule fits a parabola passing through 3 consecutive points, it is exact for polynomials of order 2. Procedural programming looks at program design as a matter of subdividing complex tasks into simpler ones and developing a function for each identified task or sub-task. OO way considers program design as a matter of identifying objects in the program (actors in a play), identifying their attributes (characteristics of each role in the play) and orchestrating interaction amongst the objects. Procedural programming (after identifying tasks and sub-tasks) requires the programmer to identify the input and output data for each function as well as data required in the main function and understand how data flows across the different functions and how data is modified by each function. A documentation of the program design using this approach requires a flowchart. OO programming requires the programmer to identify attributes of each class in the program and the list of actions that need to be performed on it. Attributes become data fields of the class and tasks to be performed on an object become methods of the class. A documentation of the program using this approach requires class diagrams, class hierarchy diagrams and state diagrams. UML could be an ideal way to represent this information. In the procedural approach, a program moves from one state to the next in a sequence of function calls, with each function modifying one or more pieces of data. When all function calls are complete, you have the results (hopefully!). In the OO approach, a program begins by first creating objects of the required class, initializing their attributes and orchestrating message passing to objects by invoking their methods which alter the attributes. When this orchestration is complete, you have the results (once again, hopefully!). In the procedural approach, the relationship that exists between the data and the functions which operate on the data is not known to the programming language (because it has no constructs to represent that relationship) and therefore is the responsibility of the programmer to be aware of this relationship and enforce it where necessary. In the OO approach, the fact that an object is a bundle of both attributes and methods (which are simply functions that act on the attributes) means that the programming language is aware that the two are related (of course this relationship is initially programmed by the programmer, but once done, it is explicitly known to the language). Being a simple class, it has only a few attributes and just one method. But we need at least one other method, a constructor, so that we can initialize the attributes with data when we create an object of this class. In Python, the constructor has the special name __init__(). It takes at least one parameter, self, the object on which to operate at run time. Additional parameters are the values required to initialize the attributes. The above class assumes that the values of the points at which the function is evaluated are stored in the array x, and the values of the function are previously evaluated and stored in y. This needs to be done in the main function, which we will see later. The sum required to calculate the integral is calculated using Python's indexing techniques. y[-1] is the last element of the array y. Similarly, y[1:-1] is the range of values of y starting from y up to (but not including) y[-1] which means up to but not including the last element. We explicitly create the data points at which the function is to be evaluated. Note that n is the number of equal intervals into which the range from a to b is divided as well as the index of the last element because Python uses zero as the index of the start element. Function linspace(firstvalue, lastvalue, numpoints) takes as arguments, the first value, last value and the number of equally spaced points. The first and last values included. We create the object T and initialize it with the values a=0, b=5, x and y. In this case, it is not necessary to specify the number of intervals because this can be found from the number of elements in x or y. The number of points in x and y is one more than the number of intervals. The Trapezoidal class assumes that the values in x and y are at equal intervals. It does not explicitly test this, which it could by testing the values in x. In fact, if this is to be taken on trust, we could simply send in the number of equal intervals n and y values since x values are not required to evaluate the integral. The interval width h could then be calculated from a, b and n.
Let us add the following code below the Trapezoidal class and above the main script. Here is some food for thought. When the two classes are so similar, can we have a class hierarchy? Can we define an abstract class for numerical integration and make the Trapezoidal and Simspon's rules its child classes?What do we gain from this exercise or is this an unnecessary wasted exercise? Is it possible to create a new child class to implement numerical equation by Gauss Legendre method? Would it make sense to have dissimilar approaches to numerical integration as children of one abstract class? It doesn't matter what the final answer is. The very exercise of doing this thinking can teach you a great deal about programming. Well, try your hand at the above two classes before attempting the class hierarchy. Good luck.